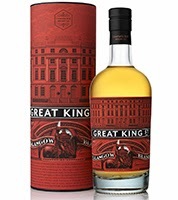 Compass Box, have today officially announced the release of its Glasgow Blend (43% ABV) the second permanent whisky to be introduced to their Great King Street range of innovative, small-batch Blended Scotch whiskies. Glasgow Blend has been created to provide a very different expression of the Great King Street house style. While the whiskies share the same moreishness, creaminess and approachability, Artist’s Blend is fruity, spicy and packed with vanilla, while Glasgow Blend is rich, round smoky and sherried. Glasgow Blend offers a rich vein of peaty-smokiness underpinned by sherry cask-aged whiskies full of dried fruit and wine character. The palate is full and round, with a sweetness typical of whiskies from Compass Box. It is made from approximately 67% malt whisky from the regions of Islay, the Highlands and Speyside and 33% Lowland grain whisky from a Fife distillery. It is aged in a combination of first-fill Sherry casks, first-fill and refill ex-Bourbon barrels with a small portion of new French oak finishing. In his 1930 book ‘Whisky’, Aeneas MacDonald mentions that Glaswegians historically preferred fulle bodied and more flavour-packed whiskies than people in other parts of the world. So what better name for a whisky such as this? For decades, The Wellington Statue, outside Glasgow’s Gallery of Modern Art, has been cheekily topped by a traffic cone, something the local population has taken to heart as a symbol of their sense of humour. It has become one of Glasgow’s most iconic images, and graces the label for the Glasgow Blend. Compass Box’s Glasgow Blend will be available from mid-October in UK and Europe, and from November 1st onwards in the US, North America and all key international markets for a RRP of £30.